Chicago's deep-dish pizza just doesn't cut it for Obama, who ordered pies from St. Louis for a feast on Friday. The verdict is in on Barack Obama's favorite pizza, and some Chicagoans aren't too happy about it. The president, whose political roots were planted in Chicago, hosted 140 people Friday at the White House for deep-dish pizza -- not from the Windy City, but from St. Louis, Missouri. 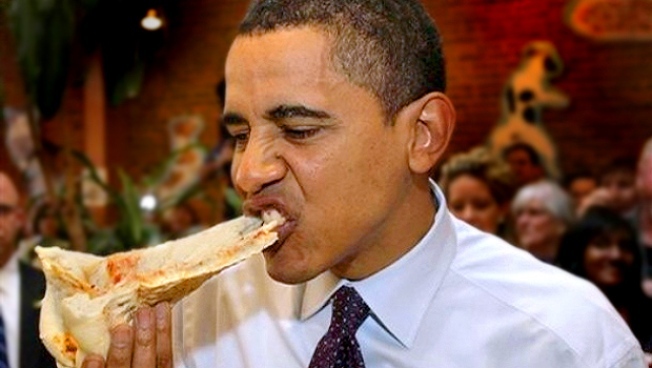 Obama invited the staff of St. Louis restaurant Pi (along with suitcases of dough, cheese and pizza pans) to Washington to help feed his guests, the Chicago Tribune reported. Pi assistant manager Lindsey Tornetto was excited over the invitation and had some friendly words for Chicago's pizza lovers. "No hard feelings," Tornetto said. "I guess he likes the cornmeal [crust]." Obama fell in love with Pi's pie while campaigning for the White House. In Chicago, however, the dough spinners aren't backing down without a fight. "I like his economic policy—I think he's going to get us out of trouble. I like his foreign policy—he's making friends around the world. His pizza policy is going to have to change," said Marc Malnati, owner of 30 pizzerias throughout Chicago. According to the Tribune report, Malnati said he's never heard of Pi, and Obama's choice must have been a sign of inexperience.